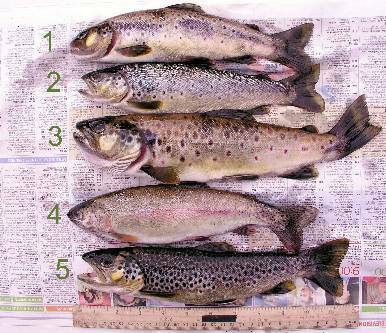 Sea Trout Salmo trutta trutta are native to the northwestern coast of Europe but have been widely introduced in Australia and elsewhere... sometimes with negative results. In the picture above the fish are numbered. Fish number 1,2,3 and 5 are sea trout. Number 4 is a rainbow trout. Sea Trout typically spend the first part of their life in freshwater and then the second part of their life in Saltwater. They matures in 3-4 years and spawn in in river. Like all trout they prefer cold waters. Sea trout feed on insects as well as crustaceans and small fish when they get older. An excellent gamefish and very good tasting.